The package geoR provides functions for geostatistical data analysis using the software R.
This document illustrates some (but not all !) of the capabilities of the package. 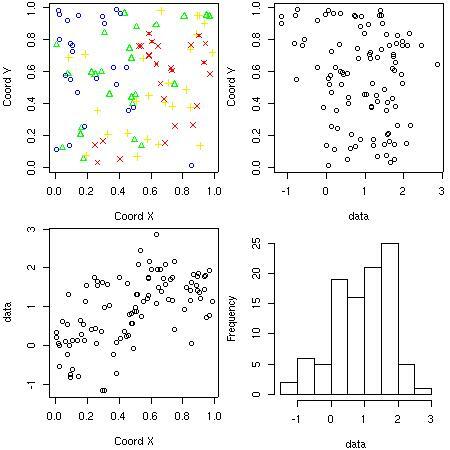 The objective is to familiarise the reader with the geoR's commands for data analysis and show some of the graphical outputs which can be produced. The commands used here are just illustrative, providing basic examples of the package handling. We did not attempt to perform a definitive analysis of this data. In what follows the R commands are shown in typewriter fonts like this. The commands shown in this page are also available in the file geoRintro.R. We refer to the geoR documentation for more details on the functions included in the package geoR. Typically, data are stored as an object (a list) of the class "geodata". An object of this class contains at least the coordinates of data locations and the data values. Click for information on how to read data from an ASCII (text) file. We refer to the documentation for the functions as.geodata and read.geodata for more information on how to import/convert data and on the definitions for the class "geodata". For the examples included in this document we use the data set s100 included in the geoR distribution. Elements covariate, borders and or units.m will be also summarized if present in the geodata object. 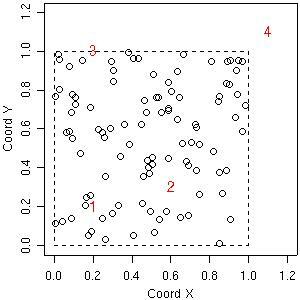 Notice that the top-right plot is produced using the package scatterplot3d. If this package is not installed a histogram of the data will replace this plot. The function points.geodata produces a plot showing the data locations. Alternatively, points indicating the data locations can be added to a current plot. There are options to specify point sizes, patterns and colors, which can be set to be proportional to the data values or specified quantiles. Some examples of graphical outputs are illustrated by the commands and corresponding plots as shown below. We start saving the current graphical parameters. Empirical variograms are calculated using the function variog. 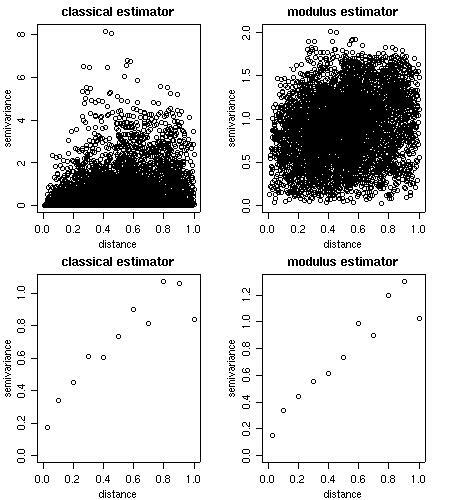 There are options for the classical or modulus estimator. Results can be returned as variogram clouds, binned or smoothed variograms. 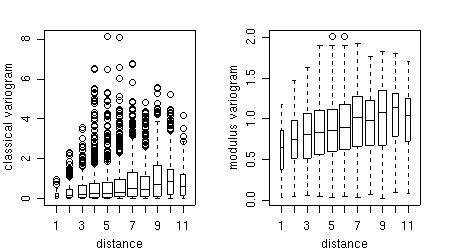 Furthermore, the points of the variogram clouds can be grouped into classes of distances ("bins") and displayed with a box-plot for each bin. 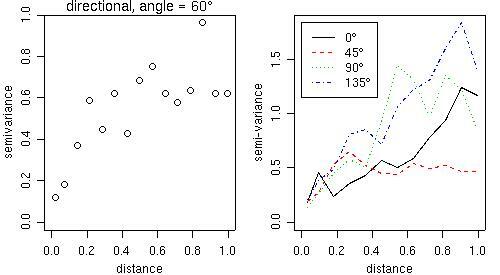 Theoretical and empirical variograms can be plotted and visually compared. For example, the figure below shows the theoretical variogram model used to simulate the data s100 and two estimated variograms. and the plot is shown on the left panel of the figure below. For a quick computation in four directions we can use the function variog4 and the corresponding plot is shown on the right panel of the next figure. Bayesian methods are also implemented and will be presented in Section 5 (using the function krige.bayes). The following commands show how to add a line with a variogram model to a variogram plot. In the parameter estimation functions variofit and likfitthe nugget effect parameter can either be estimated or set to a fixed value. 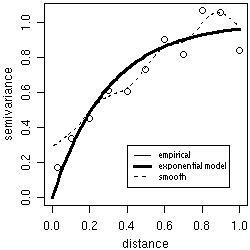 The same applies for smoothness, anisotropy and transformation parameters. Options for taking trends into account are also included. Trends can be specified as polynomial functions of the coordinates and/or linear functions of given covariates. The commands below shows models fitted by different methods with options for fixed or estimated nugget parameter. 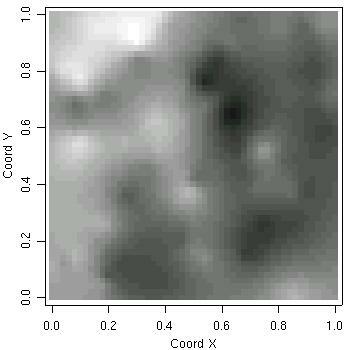 Features not illustrated here include estimation of trends, anisotropy, smoothness and Box-Cox transformation parameter. Summary methods have been written to summarize the resulting objects. Two kinds of variogram envelopes computed by simulation are illustrated in the figure below. 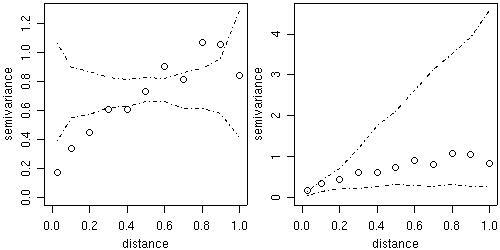 The plot on the left-hand side shows an envelope based on permutations of the data values across the locations, i.e. 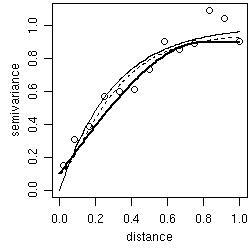 envelopes built under the assumption of no spatial correlation. The envelopes shown on the right-hand side are based on simulations from a given set of model parameters, in this example the parameter estimates from the WLS variogram fit. 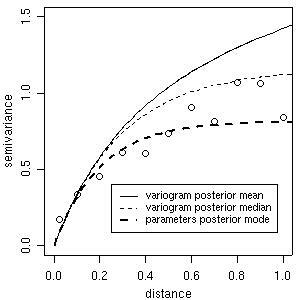 This envelope shows the variability of the empirical variogram. Profile likelihoods (1-D and 2-D) are computed by the function proflik. Here we show the profile likelihoods for the covariance parameters of the model without nugget effect previously fitted by likfit. The function xvalid performs cross-validation either using the leaving-one-out strategy or using a different set of locations provided by the user. 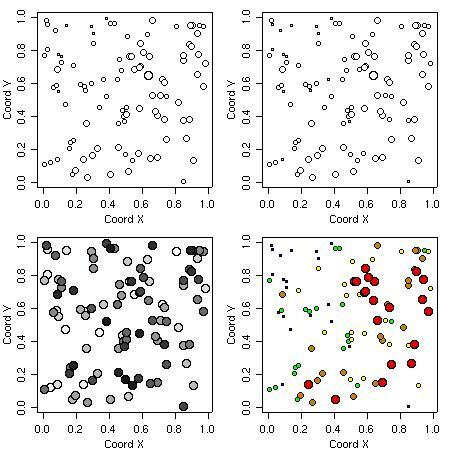 For the first strategy, data points are removed one by one and predicted by kriging using the remaining data. The commands below illustrates cross-validation for the models fitted by maximum likelihood and weighted least squares. In the first two calls the model parameters remains the same for the prediction at each location. In the next two calls the model parameters are re-estimated each time a point is removed from the data-set. Graphical results are shown for the cross-validation results where the leaving-one-out strategy combined with the wls estimates for the parameters was used. There are additional options for Box-Cox transformation (and back transformation of the results) and anisotropic models. 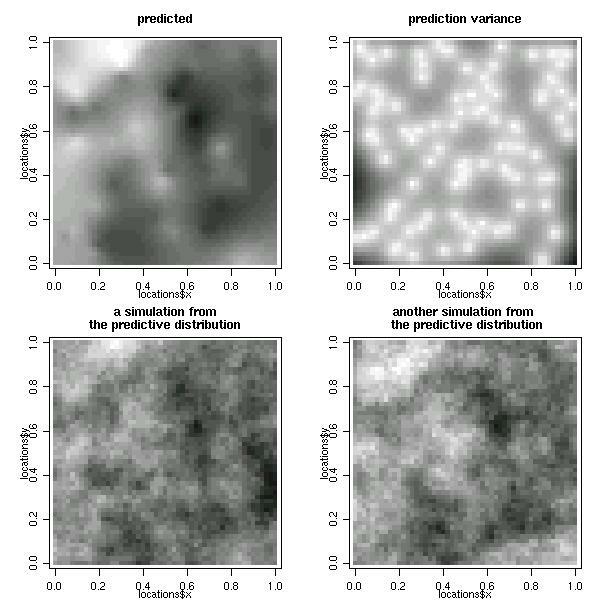 Simulations can be drawn from the resulting predictive distributions if requested. As a first example consider the prediction at four locations labeled 1, 2, 3, 4 and indicated in the figure below. The output is a list including the predicted values (kc4$predict) and the kriging variances (kc4$krige.var). 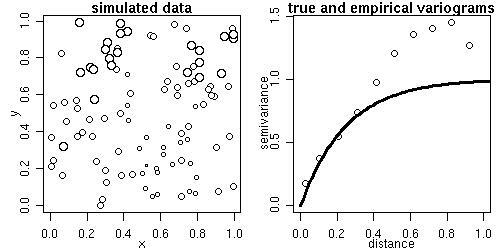 Bayesian analysis for Gaussian models is implemented by the function krige.bayes. It can be performed for different "degrees of uncertainty", meaning that model parameters can be treated as fixed or random. 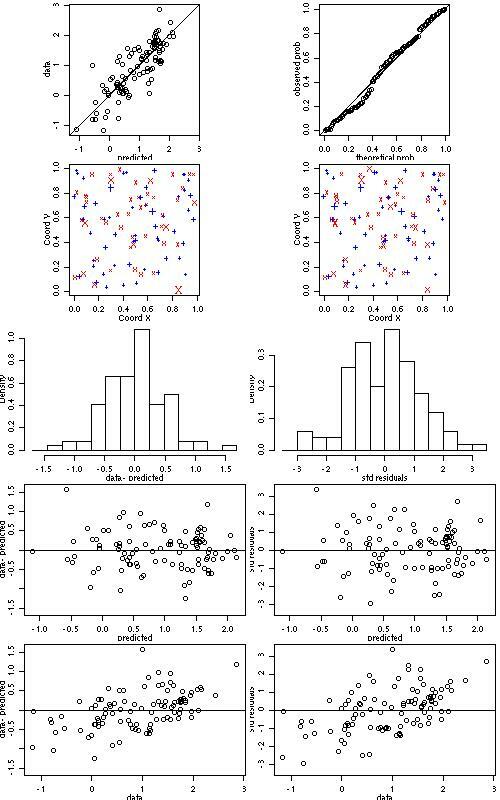 Using summaries of these posterior distributions (means, medians or modes) we can check the "estimated Bayesian variograms" against the empirical variogram, as shown in the next figure. Notice that it is also possible to compare these estimates with other fitted variograms such as the ones computed in Section 3. 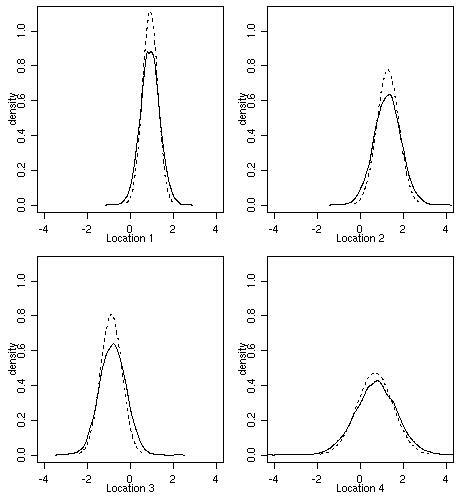 The next figure shows predictive distributions at the four selected locations. Dashed lines show Gaussian distributions with mean and variance given by results of ordinary kriging obtained in Section 4. The full lines correspond to the Bayesian prediction. 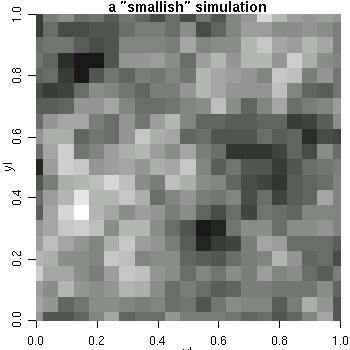 The plot shows results of density estimation using samples from the predictive distributions. Maps with the summaries and simulations of the predictive distribution can be plotted as follows. Some of its functionality is illustrated by the next commands. 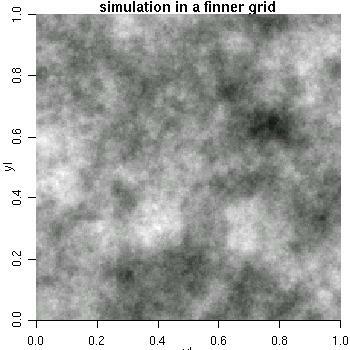 NOTE: we recommend the package RandomFields for a more comprehensive implementation for simulation of Gaussian Random Fields. The function cite.geoR() shows information on how to cite geoR in publications. geostatistical analysis. R-NEWS, Vol 1, No 2, 15-18. ISSN 1609-3631. Please cite geoR when using it for data analysis!